We recently fulfilled a dream of ours when we were able to purchase a home on the Isle of Palms, SC. We love the Charleston area and have long considered it as a 2nd home. God blessed us with the opportunity to purchase this house and we have decided to keep it on the rental market until we can spend more time there on a regular basis. Might as well recoup some of the cost, huh?! :) But, that is not the point of this post…….. I have recently been struggling with some decisions related to my career. I have been praying for over a year for God to show me the path to take. Now, that is the right thing to do as a Christ-follower, but I seem to need to “help” God show me the right path. I find myself spending an enormous amount of time worrying, searching options, and generally obsessing over these decisions. Finally, when I realized that God was not leading me to anywhere specific, but to just leave my place of employment, I admit to being uncomfortable with this. I didn’t like leaving without a place to go. You see, I am a bit of a control freak and I do not like uncertainty. This was forcing me to put it all in God’s hands – where it should have been all along. To make a long story short, I resigned from my job and accepted my responsibility – to wait. I have had some writing that I needed to do but have been unable to do because of work overload and added job responsibilities that consumed me 24/7. I decided to take this waiting time to get some of that done. So, last week I headed down to our IOP house to work on some revisions and get a little writing done. I also took a lot of walks! Our house sits on the edge of a lagoon, at the back of a golf course. 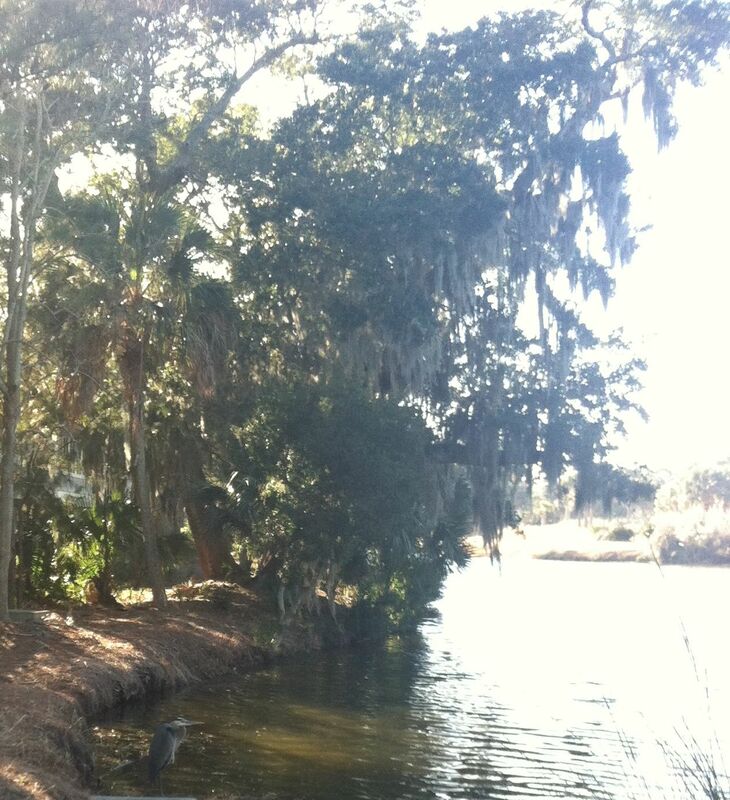 The lagoon is home to many water fowl and other wildlife (supposedly, there are 2 alligators calling it home). We have noticed one particular heron, we call Herbert, spending a lot of time on a tree limb on the edge of the lagoon. Herbert makes me laugh. He spends most of the day just standing on the log, occasionally spreading his wings and soaking in the sun. He seems oblivious to the world around him , despite numerous other birds flying in and out and all around him. As I often do, I began thinking about what it really means to “know”. I am a nurse educator and a researcher, so I have explored the concept of knowing at length. Carper’s (1978) is noted for his four fundamentals of knowing: personal, empirical, ethical, and aesthetic. Without spending a lot of time in an academic discussion, let’s just say there is much more to “knowing” about something than just having the information. Real “knowing” requires reflective practice which requires time……..and being still. See where I’m going? I have often recited this verse to myself, hoping to inspire some sense of calm and patience. The effect was miniscule, at best. I now realize that I was doing it all wrong. “Being still” means not trying to help God or offer Him suggestions. He has it under control. I just need to be still…….and wait. While waiting, I will be open to “knowing” Him and His will for my life. I expect the miraculous and I know He has a plan for me. For now, I wait and “be still”.